Steve Jobs, founder of Apple (NASDAQ:AAPL) and Pixar (NYSE:DIS) was an iconic manager with a zest for taking on feats deemed impossible. He was able win over an entire planet. His Eastern beliefs set him apart from Western leaders. With an intense focus on what should be, he disrupted dysfunctional markets with simple elegant replacements. His Eastern wisdom encouraged focus and to “Think Different,” which may have meant to experience the moment. The 10 Lessons of Steve Jobs are excerpts from Walter Isaacson’s, “The Real Lessons of Steve Jobs,” published in the Harvard Business Review, April 2012 (hbr.org/2012/04/the-real-leadership-lessons-of-steve-jobs/ar/1). Isaacson gives 14 lessons. For the iPod, Jobs’ Zen simplicity shinned through when he eliminated the on/off button. The device gradually powered down, and flashed on when reengaged. Jobs also developed complex systems with integrated hardware and software so the user devices could be simple and focused on a few tasks. An ecosystem—an iPod connected to a Mac connected to an iTunes store—allowed for a division of labor. The MAC could handle system administration, freeing the portable devices play music or show videos. Later, Jobs aimed for mobile phones, and he would grab a competitor’s phone and rant that features could not be navigated, including the address book. His iPhone did not need a user’s manual. At the end of his career, Jobs rethought the television industry, so people could click and watch what they wanted. He dreamed up ways to make television simple and personal. Apple took end-to-end responsibility for the user. From the performance of the ARM microprocessor to the experience in an Apple Store, everything was tightly linked. Part of Jobs’ compulsion for “the whole widget” stemmed from his controlling personality. But it was also driven by his passion for perfection. The strategy set Apple apart from competitors. Innovators don’t have to be pioneers. With the original iMac, Jobs focused on managing photos and videos, but not music. People were downloading music and then burning their own CDs. The iMac’s drive couldn’t burn CDs. Jobs said, “I thought we had missed it.” But instead of upgrading the iMac’s CD drive, he created an integrated system that transformed the music industry. The combination was iTunes, the iTunes Store, and the iPod, which allowed users to buy, share, manage, store, and play music better than any other way. After the iPod became a huge success, Jobs thought phone makers might displace it by adding music in the handsets, so he preempted them with the iPhone. Jobs’ (in)famous ability to push the impossible was dubbed his Reality Distortion Field, after an episode of Star Trek in which aliens create an alternative reality through sheer will. An early example was when Jobs was on the night shift at Atari and pushed Steve Wozniak to create a game called Breakout. Woz said it would take months, but Jobs stared at him and insisted he could do it in four days. Woz ended up doing it. Jobs personally spent time designing the jewel-like boxes for the iPod and iPhone and listed himself on the patents. He believed that unpacking was a ritual and heralded the glory of the product. For the iPhone, the initial design had the screen surrounded by an aluminum case. The problem was that the iPhone should have featured the display, not the case. The team changed it so the glass display was the phone. Jobs believed creativity comes from spontaneous meetings. “You run into someone, and ask what they’re doing, you say ‘Wow,’ and soon you’re cooking up all sorts of ideas.” The Pixar building’s design promoted unplanned encounters around an atrium. He commented if a building didn’t encourage innovation, you lose the magic sparked by serendipity. Jobs’ passion was applied to issues both large and small. Some CEOs are great at vision; others know that God is in the details. In 2000 he came up with the grand vision that the personal computer should become a hub for managing all of a user’s content, and got Apple into personal-devices. In 2010 he came up with the successor strategy—the hub would be consumed by the cloud—and Apple began building a huge server farm to upload and sync content to personal devices. Jobs asserted his counterculture personality in ads, proclaiming his hippie beginnings. 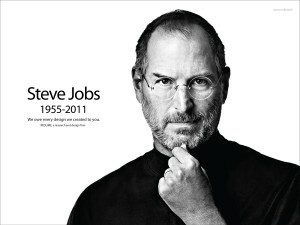 When he returned to Apple, Jobs helped write the text for the “Think Different” ads: “Here’s to the crazy ones. The misfits. The rebels. The troublemakers. The round pegs in the square holes…” If there was any doubt that, consciously or not, he was describing himself, he dispelled it with the last lines: “While some see them as the crazy ones, we see genius. Because the people who are crazy enough to think they can change the world are the ones who do.” In his commencement address to Stanford, he admonished students to follow their own dreams, and not to get caught up in living someone else’s life.